For Christmas this year, I am putting together goodie bags for my friends and neighbors. My mom is helping me because she is the master of goodie bags! 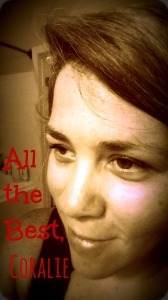 The outcome would not be nearly as awesome if she were not helping me- that is certain. 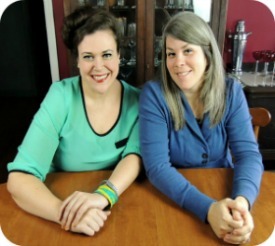 We are going to have a bake-a-thon this weekend to get everything together- our list is a mile long! So, I have started doing what I can ahead of time to knock some things off our list. One of the goodies on my list is Bourbon-Bacon Jam. I was first introduced to this manna a couple of Christmases ago when a dear friend made it for me (and others) for Christmas. I was immediately taken with it. Bub and I devoured it! And I put it on my list of to-do someday. That day has finally come and it is a great day! 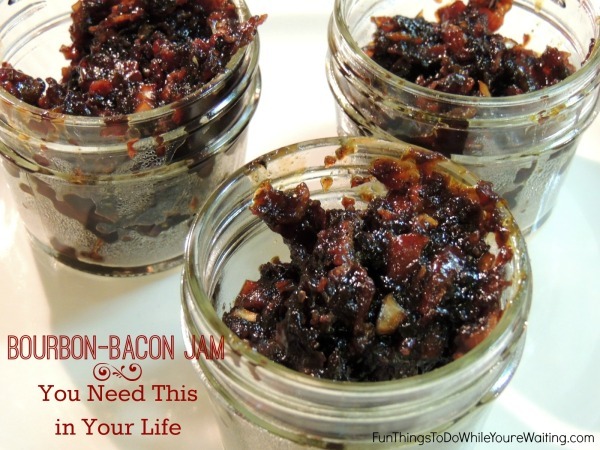 I was cruising the corridors of Pinterest when I came across this bourbon-bacon jam pin. No questions asked, I pinned it. She had adapted her recipe from Martha Stewart’s recipe. 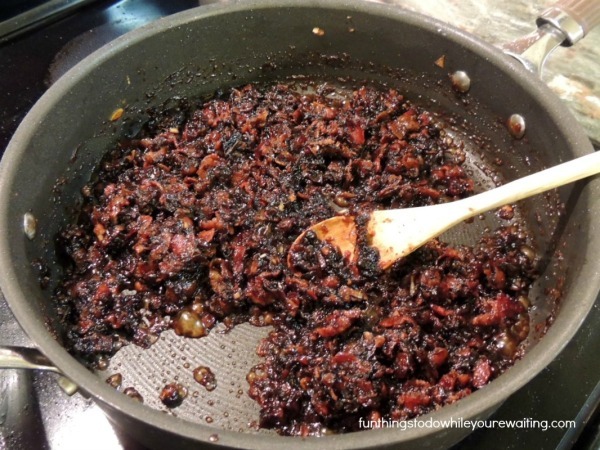 And when I started putting my list together of goodies, bourbon bacon jam was first on the list and it was something I could make a little early. 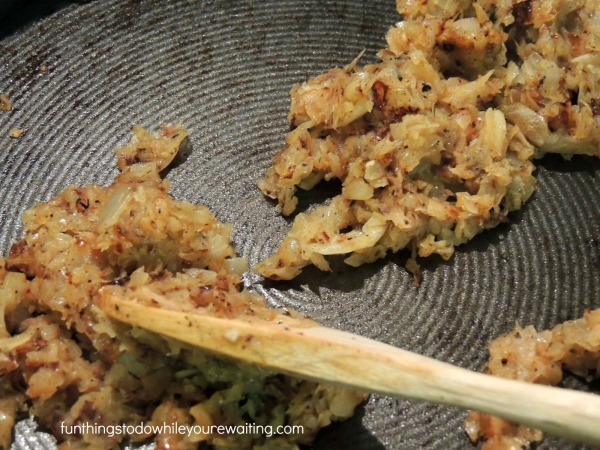 The original pinner said it was an easy recipe and I thought to myself- it doesn’t really matter because I am making this regardless, but- we’ll see. All said and done- it was pretty easy. First thing you cook a pound and half of bacon. I have never cooked that much bacon at one time! You cook it to the crispy point.I used 2 pans to get the job done quicker. And while that is going on- you chop up one large Vidalia onion or sweet onion- I used my little food processor to get that job done quicker as well. In the end you need 2-3 cups of onion. Also, the original recipe called for 2 cups of shallots- I could not find them at the grocery store- so, I left them out. Once you get your onions all chopped, you caramelize the onions using some of the bacon grease on medium heat or so. So. Your bacon is cooked and set aside on paper towels. You are caramelizing onions- while that is happening, chop up 4-5 garlic gloves. The original recipe called for Maple syrup… well, it is expensive and I only needed 1/2 cup- I already had molasses in my pantry- I made the executive decision to use it instead. In the end, I found this jam recipe to be pretty flexible. Once your onions are well on their way to being caramelized, you add the garlic and cook for about a minute or so and then add the chili powder and paprika and stir to combine. You may want to crank your heat- I did not need to but, you might. Carefully add your bourbon and syrup or in my case, molasses and let it boil for about 2-3 minutes. Then add the balsamic vinegar, brown sugar and bacon and stir to combine and let it continue to boil for another minute or two. As far as the bacon goes- you can either use a knife to roughly chop it up or you can do as I did and use your finger to crunch and pull part your bacon- either way is fine just fine. You may find that there is an over abundance of bacon fat in your jam and you may want to strain that off using a sieve- I wasn’t in that camp. And you are facing another decision- you may want to send this through the food processor to make this closer to a puree… I wasn’t in that camp either. Yummy and delicious and wonderful and everything. I think this would be the perfect condiment to Connecah sausage or severed with cream cheese and crackers. Yep. OMG. When the onions are well on their way to being caramelized, add the chili powder and paprika and stir to combine. Let cook for 2-3 minutes and remove from heat. Place in jars or containers and let cool. Do you make goodies for the holidays? If so, what is on your list? Do you look forward to certain things that your family, friend and neighbors make? Uh, Momma’s Hawaiian bread, Memaw’s divinity, Pammie’s cakes and Snuggie’s chocolate pecan pie- Yes, I get around! I am thinking this bourbon-bacon jam will also become something I look forward to at Christmas too. Previous Article← Our 2014 Favorite Things!